The Traditional Cover Letter. Is it Outdated? Attaching a cover letter to an email is tedious for recipients. Pasting letters makes LONG emails. Concise, fact-based cover notes are key! 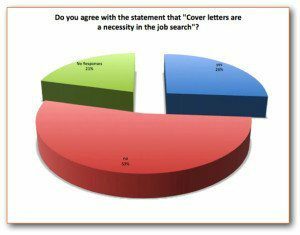 A recent survey by the global careers association, Career Directors International, showed 53% of hiring authority respondents believed that a cover letter wasn’t necessary. Extra comments accompanying the question showed recipients were bored with seeing the same old thing. So why should we all go to the trouble of writing these things if no-one is going to read them… right? Wrong. First, what about the other 47% of people who do read them? Should we forget them? Those people may be in the position to hire us and we’ve thrown away an opportunity to impress! That’s just seems plain wrong. Maybe the idea is to make cover letters more interesting, more contemporary and not just get the 47% to read them, but aim to win over that pesky 53% too! First, let’s look at what you do with your cover letter. Do you attach it as a separate file to your email, along with your resume? If yes, then what do you say in the body of your email? Do you squander the opportunity by writing “Please find attached a copy of my resume in support of my application for VP of Banking”? Or perhaps you paste the entire cover letter in the email to test the reader’s patience, their time, and their tolerance for duplication. Neither of those options sound like a winning strategy do they? Enter, today’s default cover letter: the E-Note. The E-Note is a shortened cover letter for the digital age where emails are sorted and decisions made with snap-your-fingers speed [Tweet This] in a world where people would rather hit “archive” than resort to the tedium of information overload (well-written or otherwise). The E-Note, at just a third to a half a page, cuts away the fluff and waffle, and gets to the core of what the decision maker needs to know. Written right in the body of the email, the E-Note has several advantages. By virtue of it being right there when an email is opened, there is a good chance it will be read (or skimmed at least). It starts selling you before the hiring authority even sees the Word attachment. So it provides your best selling points immediately. It is concise, facts-based, and shorter than a cover letter—making it reader friendly. It provides insight into the jobseeker via a signature block with LinkedIn and Twitter links, along with, Email, Mobile, and any information you want to provide (such as locality preferences and branding statements). It can bypass the traditional formalities. A cover letter without a “Dear Name” looks plain rude; yet an email without a name is fine and helps overcome the limitations of those blind advertisements where no name is given. 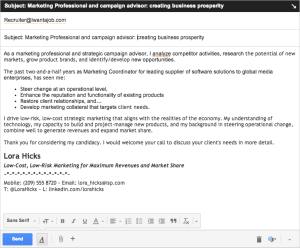 Here is one of these new cover letter examples (e-note) on the right. (You can click on the image to see a larger version). 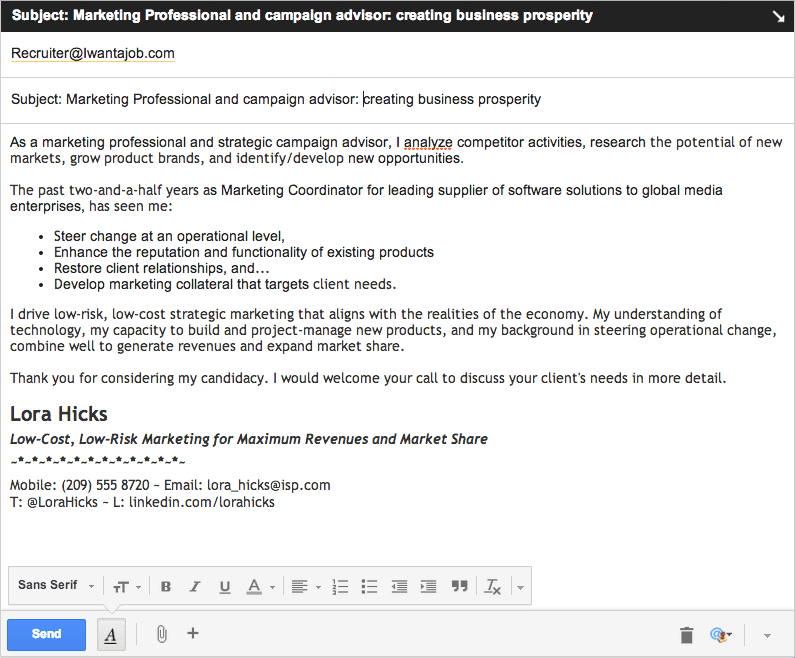 At just 167 words it cuts through the typical 400+ word cover letter. Note that the subject can hold your branding statement or some important element that meets the needs of the employer or reader. Note also the signature for personal branding, social media and other contact elements. Create a punchy subject line. Exert care when using words or phrases that may send your email to the SPAM filter. Develop a two-line opening based on your background or current job that will catch the eye and relate to the job for which you’re applying. Follow with three or four one-line bullet points that provide verifiable facts. Remember, this is a “Fluff and Waffle-Free” zone! Create a three-line paragraph summary that highlights an important career point. Finish with a call to action. You want them to call you or you will call them. End with a signature block with important information.